The first century or two, this system worked because Apostles would resign or be excommunicated or die young. It's also good that this happened, because there seemed to be numerous attempts to stack the deck in the Quorum of the Twelve with relatives. Joseph Smith insisted his brother William be an Apostle when the Three Witnesses, whom Joseph has commissioned to select the original Twelve, were all against it. Brigham Young selected three of his sons to be Apostles (though two of them never actually joined the Q12). John Taylor called one of his sons; Wilford Woodruff called one of his sons; Joseph F. Smith called two of his sons, one of whom (Joseph Fielding Smith) eventually became the Prophet. There are also numerous examples of sons or grandsons of Apostles also becoming Apostles (see Smith, Richards, Lyman, Cannon, Grant, Whitney, Merrill, Cowley, Kimball, and Ballard). It's been over 70 years since an Apostle resigned or was excommunicated, so the only other way of getting new blood in the Quorum is due to illness or natural causes affecting a current member. 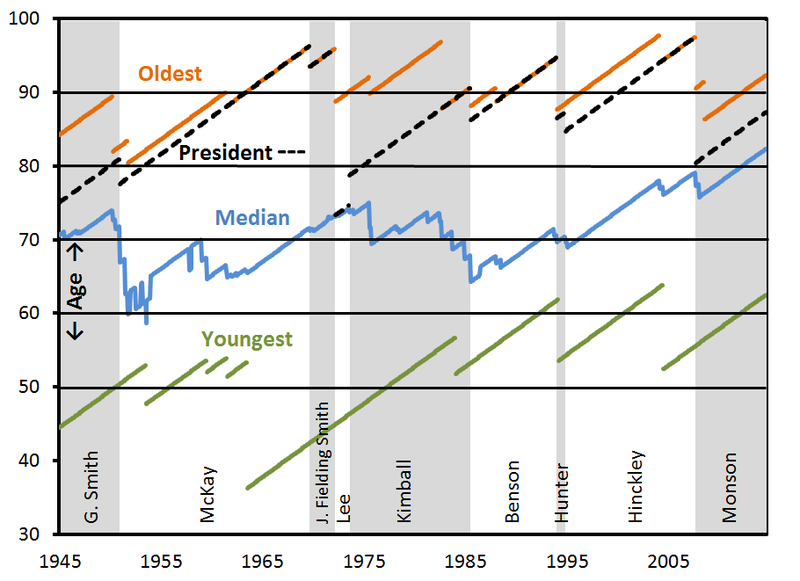 Age has therefore been a factor in governance of the church, most famously when Gordon B. Hinckley was made Third Counselor in the First Presidency because Pres. Kimball and his two counselors were too infirm to do their jobs. Right now of the 15 Brethren, two are in their 60's, four are in their 70's, and the other nine are in their 80's or 90's. 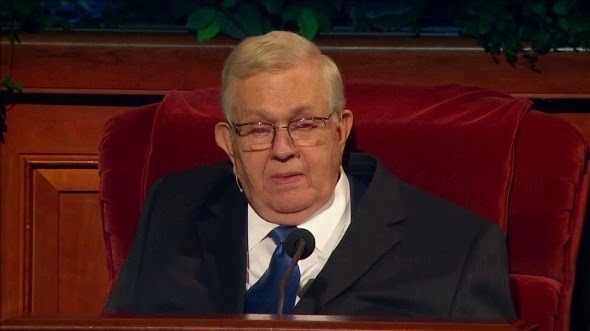 Not to be morbid, but Elder Packer is to the point where each General Conference feels like his last, but the next two in line are in their 90's and they both seem like they have a few years to go. Now say they decided to implement this policy this April. Elders Packer, Perry and Nelson would be designated emeritus with a vote of thanks, and there would be three new Apostles. Let's say their ages are 60, 53 and 50, and two of them are non-American. Elder Oaks would become President of the Q12. Let's now say that Pres. Monson lives five more years. April 2020, Oaks would become the new Prophet at age 87. Elders Ballard and Scott will have been made emeritus already, and so two younger Apostles would have been called before Pres. Oaks makes his first calling. Elder Hales would be President of the Q12, and then 12 of the 15 Brethren would be in their 70's or younger. Another advantage is the constant fluctuation of cultural differences in Quorum. Sometimes it seems like there aren't enough delineations over what is doctrine, what is policy, and what is just cultural, which is to say we've made certain policies because of cultural bias. It feels like The Church of Jesus Christ of Latter-day Saints is due for some big things in the 21st century, and this would be a significant policy change that could help the leadership lead on those very things.